Shrewsbury Town manager Gary Peters has left the club by mutual consent. It follows a poor run of form which has seen the team take six points from 12 matches, with only one win this year. "Whatever we can do for us to get results we need to do. If that means me leaving the club then that is what needs to be," said Peters. 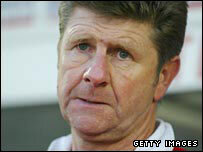 The 53-year-old has been in charge since November 2004 and leaves the club 16th in League Two. Assistant boss John McMahon takes temporary charge. Peters' finest hour at the helm was during the 2006/07 season when Shrewsbury reached the League Two play-off final at the new Wembley where they were beaten by a strong Bristol Rovers side. Chairman Roland Wycherley said: "It was a very difficult decision bearing in mind the way Gary has taken the club forward, particularly the trip to Wembley last year, and the year on year progress that we have made. "It is with much reluctance that we've agreed that Gary will leave. We believe that we are acting in the best interests of the club." Peters' last game in charge was the 4-1 defeat to Barnet on Saturday, which left the club without a victory in seven matches. "The results that we've had over the last 12 games haven't been good enough and I wouldn't have been surprised if I had been sacked," Peters said. "That hasn't been the case and it has been a mutual agreement between the chairman and myself that I have decided to leave Shrewsbury Town." Managing director Rob Bickerton confirmed to BBC Radio Shropshire that Peters left for the good of the club. "Gary felt the negativity that was being shown towards him might affect the team," he said. And Bickerton admitted he had already received enquiries about the vacant manager role.